With the uprising against him showing no signs of abating, Syrian President Bashar al-Assad is widely unpopular in neighboring countries. And the vast majority of Jordanians, Egyptians, Tunisians and Turks would like to see him step down. In Lebanon, however, views differ sharply along sectarian lines, with Shia Muslims overwhelmingly expressing support for the Assad regime. Even though many would like to see Assad out of office, there is no consensus on taking action to dislodge him from power. There is limited support for tougher international economic sanctions or Arab military intervention, and very little support for Western military action. These are among the key findings from a survey by the Pew Research Center’s Global Attitudes Project, conducted from March 19 to April 20, prior to the May 25 massacre in Houla, Syria, as well as other recent acts of violence against civilians by pro-Assad forces. Large majorities hold an unfavorable opinion of Assad in Jordan, Tunisia, Egypt and Turkey. In Lebanon, which was occupied by Syrian forces for three decades before they withdrew in 2006, about six-in-ten (59%) express an unfavorable view of Assad, but opinions of him vary dramatically across the country’s major religious communities. About nine-in-ten Lebanese Sunni Muslims (92%) express a negative opinion of Assad, as do 66% of the country’s Christians. However, almost all Shia Muslims (96%) have a favorable view of Assad, who is a member of the Alawite sect, an offshoot of Shia Islam. 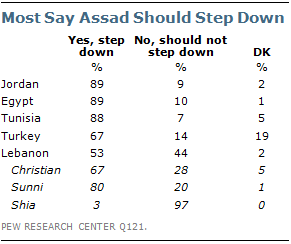 Nearly nine-in-ten say Assad should step down in Jordan, Egypt and Tunisia, and two-thirds agree in Turkey. Again, views in Lebanon reflect sectarian divisions: 80% of Sunnis and 67% of Christians want Syria’s autocratic ruler to leave office, compared with just 3% of Shia Muslims. The widespread desire for Assad to step down does not translate, however, into support for economic sanctions or military action against Syria. 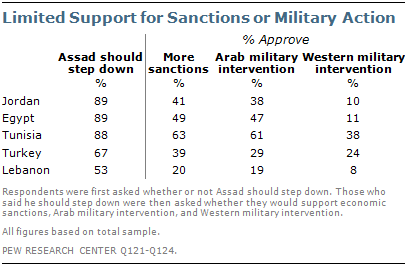 Tunisia is the only country in which a majority approves of tougher sanctions on Syria. Similarly, Tunisia is the only nation polled in which most would support military intervention by Arab states to remove Assad from power. And there is no country in which a majority favors military intervention by Western countries. About four-in-ten Tunisians (38%) endorse this idea, while fewer than a quarter in Turkey, Egypt, Jordan and Lebanon support Western military action.